A disciplined, relentless Pioneer squad overcame a late 3-point bomb from Jeremy Senglin from Weber State at 6.3 seconds remaining to tie the game. 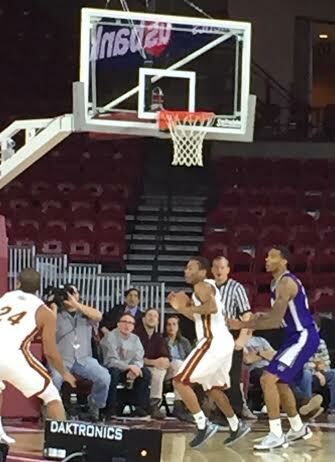 DU drove the length of the court and Marcus Byrd was fouled with 1.5 seconds. He hit the first free throw and intentionally missed the second to end the contest 69-68. Heading into the game, DU had to stop Weber State's two big guns, Joel Bolomboy a 6'9" center/forward who was scoring 17.3 points per game and shooting guard, Jeremy Senglin with 20.7 points per-game - and they did just that. DU held the dynamic duo to 14 points each. In the first half, the Pioneers were scoring from the outside with 7 3-pointers while Weber State was comfortable scoring in the paint. Weber State jumped out to an early 7-5 lead but a scoring run that included 3-point shots from Engesser and Byrd extended DU's lead to 10 points, 17 -7. The Wildcats came storming back and took a two point lead but the Pioneers responded with a final push at the end of half and went to the dressing room with a 37-32 lead. Denver carried 50%+ FG shooting and 50%+ from the arc into half. All season long, they have maintained an impressive field goal percentage with well selected shots within their offensive system. Against Weber State, a clearly more imposing physical presence, the Pioneers played smart ball and stayed composed, especially when being punished in the paint. Freshmen Thomsa Neff, always solid on the defensive end, continues to get more comfortable on the offensive end with 9 points. Engesser got a 'quiet' 26 points coming off the bench. Unsung Marcus Byrd chipped in with 12 points, 3 rebounds and three assists. Super freshman Joe Rosga had another great all-around game with 11 points and led the Pios in both rebounds (5) and steals (4). Jake Pemberton continues to play an increasing meaningful role with the team by scoring 9 points and dishing out a team-leading 6 assists and a steal. Bryant Rucker was quiet with two assists and C.J. Bobbitt sat out the game with the effects of mono. Eight players played double digit minutes. This is a team that is young and, generally, not as physically imposing as their opponents. They continue to provide a great brand of basketball while developing freshmen at the same time. They leave it all on the floor as one of the most unexpected, over-achieving squads in Coach Joe Scott's tenure. For the game, Denver shot 54.3% from the field and 48.1 from the 3-point arc. For their next game, Denver travels to the University of Northern Colorado this Wednesday at 7 p.m. MT.